Matthew Bradbard is from New England and studied Finance at Northeastern University & the University of Sydney. He has been a member of the NFA since 2000. Matthew Bradbard founded and remains president of MB Wealth Corporation. Subsequent to establishing MB Wealth, he worked at various brokerages over his tenure in commodities. In addition to being the president and trader for MB Wealth, Matthew Bradbard publishes subject specific articles and a weekly market commentary that you can find in various financial and trading resources. 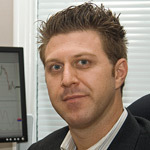 He has helped identify and develop several trading strategies in numerous commodities markets for his clientele. He has always been a hands-on broker with proficiency in fundamental as well as technical analysis. Over the years he has cultivated relationships with floor traders, farmers, grain marketers, and end users.